The original ‘Tibetan’ singing bowls came from Kham. This is the old name for Tibet. The Tibetans made the original bowls. In old Tibet the knowledge was in books written in gold. The Chinese burned these books for the gold. All the knowledge was lost. Only some Rimpoches knew this information. Then when they moved they took their knowledge and skills to other countries. Now these bowls are being made in India and Nepal using new techniques. In modern day, many bowls are made with machines and may only have one to 5 metals (zinc, iron, lead, copper and tin). These are okay for meditation or as a mantel piece. 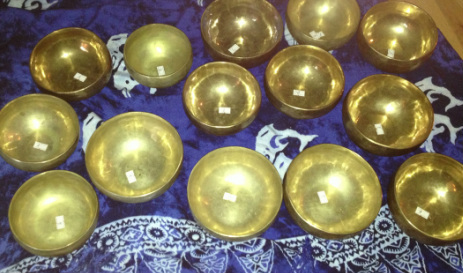 The Healing Bowls used in my practice are made in Nepal, traditionally by hand and have 7 metals (zinc, iron, lead, copper, tin, gold and silver). The Sound/Vibration from the bowls is proven to have strong healing properties. Since we are made up mostly of water, our bodies react the same as water does. The vibration from the bowls resonates with the body allowing each molecule to reverberate at a high and healthy frequency. They are used for cancer treatments, migraines, tinnitus, stress and muscle aches and pains, aura clearings and overall feelings of wellbeing and health. During a treatment the client lays fully clothed on a mat on the floor, I use cushions to support the knees and client is tucked in with a wrap to prevent movement and to feel snug, warm and safe. The bowls are placed around the body at specific Chakra points and then played according to traditional methods. The receiver will then enter a deep meditative state where relaxation occurs. In the state the client will often receive insights, have out of body experiences, and gain answers to long sought after questions while simultaneously experiencing a deep physical, mental, emotional and spiritual healing.